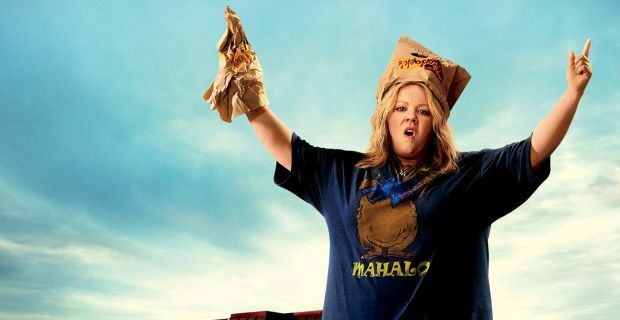 There is a scene in Tammy where the titular character played by Melissa McCarthy is dancing to Macklemore and Ryan Lewis’ hit song, “Thrift Shop,” whilst wearing a paper bag over her head before robbing a fast food restaurant with a fake gun made out of another paper bag and sunglasses. This particular sequence struck me as being one of the most American scenes in cinema to release this year. Of course, that whole statement is laden with sarcasm but I am somewhat serious. We have come to a point in American filmmaking where not only does pop culture have to be a part of a lot of films, but also, it’s films like Tammy that make me question the palette of American audiences as a whole. I know I’m generalizing here, but if people go out in droves to see Tammy, then what does that say about us? Does that say that we support watching Melissa McCarthy struggle to jump over a fast food counter because of her weight? I most certainly do not, as McCarthy has immense strengths as an actress, but with Tammy, it’s hard to believe she had any to begin with. One of the biggest comedic misfires this year, even topping Blended, Tammy follows the titular character as she gets fired from her job, learns that her husband Greg (Nat Faxon) has been cheating on her with Missi (Toni Collette), and decides to go on a road trip with her alcoholic grandmother, Pearl (Susan Sarandon). Along the way they meet up with Pearl’s lesbian cousin Lenore (Kathy Bates), her girlfriend (Sandra Oh), and even a father/son duo dealing with grief (Gary Cole and Mark Duplass). Ben Falcone and Melissa McCarthy (real-life married couple and co-writers of Tammy) try to balance comedy and drama to make the main character more understood after doing such outlandish things like robbing a fast food joint. Instead though, the drama is thrown onto the seesaw of comedic and dramatic brevity like a one-ton anvil that catapults all humor into misunderstood mediocrity. Surprisingly, I don’t think many people find a diabetic and alcoholic elderly woman in a drunken slumber who also may be dead that funny. It seems that Tammy wants to showcase an earnest story of a good woman making bad decisions and trying to find her way in life. You know what, I am totally fine with that message. It’s too bad that all of the characters and their respective performances have the emotional depth of reality TV stars (no, not entirely looking at you Kardashians–stop being so selfish). We are supposed to feel for a woman that hits a CGI deer with her car, riffs off the fact that it’s dying, and then proceeds to feel surprised when it kicks her then runs off. I wouldn’t even call the humor in Tammy stupid because I know there are people out there that find this sort of thing funny for whatever reason. Tammy also showcases the who’s who of people who can carry comedy-dramas. Toni Collette, who previously starred in the fantastic The Way Way Back, is reduced to having fewer than three lines of dialogue for the whole film. Nat Faxon, who also starred in The Way Way Back, has the same amount of material as Collette and is one of the facets that should have been probably at the forefront of drama included in the film. Seriously, these two immensely talented actors are playing characters that are having an affair with each other that impacts Tammy’s life…why aren’t they given a chance to provide a more in-depth look at a failed marriage? Tammy fails as a drama partially because of this lack of exploration into how the main character is the way she is. Gary Cole, the man who is in everything from HBO’s Veep to Talladega Nights, is reduced to a mere plot device that drives a wedge between Tammy and her grandmother. His son, played by The League’s Mark Duplass, is supposed to be the character that shows Tammy what true love really is. Instead though, we get a phoned-in performance that is as charismatic as the deer that got hit by Tammy in the beginning of the film. That’s what Tammy boils down to, though: a shallow missed opportunity for all parties involved. Melissa McCarthy is an actress capable of so much more than just fat jokes, and she shows that in spades in Bridesmaids and This is 40. Here’s to hoping that she finds that footing between comedy/drama again because after Identity Thief and Tammy, good will is being depleted.